Shown in a beautiful cherry wood, the detailed wood grain pattern really complements the design of this Amish Ripple Back Server. 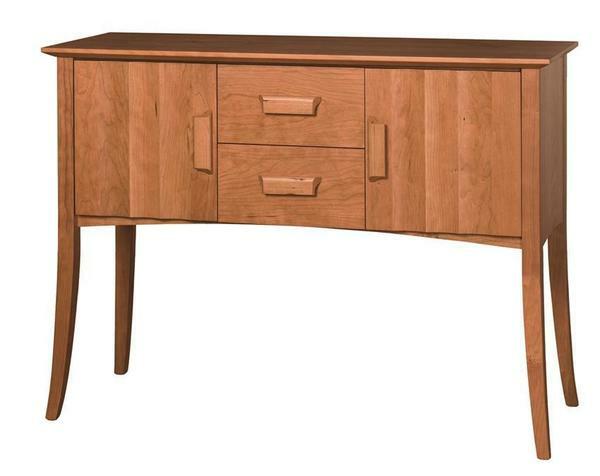 With solid wood door and drawer pulls along with a solid wood design, it's evident that the focal point of this stunning American made server is the premium hardwoods used to build it. Choose from a variety of other premium North American hardwoods as the wood type for your custom Amish Ripple Back Server to create a custom look that best fits your style. For less of a focus on the wood, choose a different knob or door pull to ad a distinct accent to your server. With a more modern look, this handcrafted server will give your dining room an upscale feel. It can also be used as an entryway or living room table.